The tack and equipment at AETA is generally a little boring to me. A lot of it seems like exactly the same stuff over and over, and when I go looking for something new and exciting there isn’t much to be found that I actually like, because I’m picky. I did find a few pretty neat things this time though, even if I liked some more than others. First and foremost – the new Majyk Equipe boots. Y’all know I’m a big fan of their XC boots, and I’ve been waiting not-so-patiently for the new line of open front and ankle boots to come out. AETA was their debut, and I was not disappointed. I fell truly, madly, and deeply in love with their new stud closure leather boots. I’m not usually even drawn to a leather boot but these are wow. The breathable hyperfoam lining (which is removeable), the gorgeous leather, the pretty elastic, the stud closures… it was a swoon moment. For those of you who like the classic aesthetics of a boot like Equifit but (like me) hate the fit and heat retention of memory foam lining and don’t want fake leather, these are the pièce de résistance. I can’t wait to get my hands on them. The price was reasonable too, I want to say retail was like $180 for fronts and $130 for hinds? Excellent price point for leather. I think I spent so much time in the ME booth caressing these boots that I could basically be a rep now. Plus a new incarnation of their previous velcro closure open front and hind ankle, with a new and improved strike guard material called ARX, which is a dilatant foam. All dilatant foams basically are full of molecules that are soft in their every day state so that they move with the horse’s leg, but at the moment of impact the molecules change their composition and harden to form a protective wall. After impact, they return to normal. The idea is that this kind of material doesn’t interfere with natural movement, but provides exceptional protection when needed. Pretty neat concept. 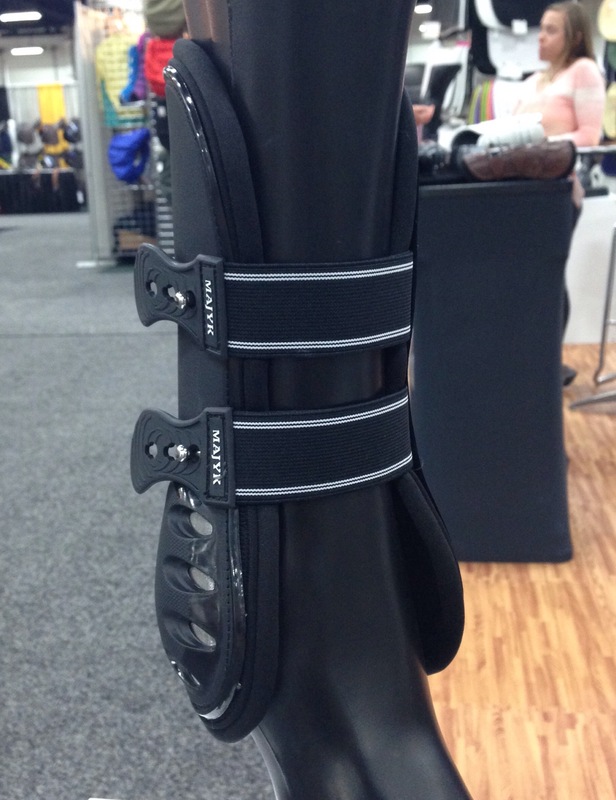 Another boot and equipment company that I saw was eQuick, who had jump boots, XC boots, and girths. I have to admit I wasn’t a big fan but they definitely have a different look to them. The strike zone areas are filled with a blue liquid gel. Their XC boots have a “quick release” tab… basically you pull the orange stick out and the velcro tabs fall off the boot, so it just drops right off the horse’s leg. Neat idea, I just didn’t love the execution since all I could picture was my disaster of a self losing the orange stick thingy and all the straps. Perhaps people more organized than myself would have good luck with them. Another item with that caught my eye was the Invictus half pad. I’ve heard a little about it but never seen one before. It’s interesting because it uses D3O (another type of dilatant foam)… it’s thinner like a Thinline pad, but when you squish it down it feels almost like a Supracor. I stood in the booth and watched the video about it a few times, it was a little mesmerizing. Something I’d definitely be interested to try, at least. and the Acavello Opera stirrups, which are kind of interesting looking but I didn’t really learn much about how they work. The price point is definitely lower than I’m used to seeing for these “space age” type of stirrups though-they retail around $130. 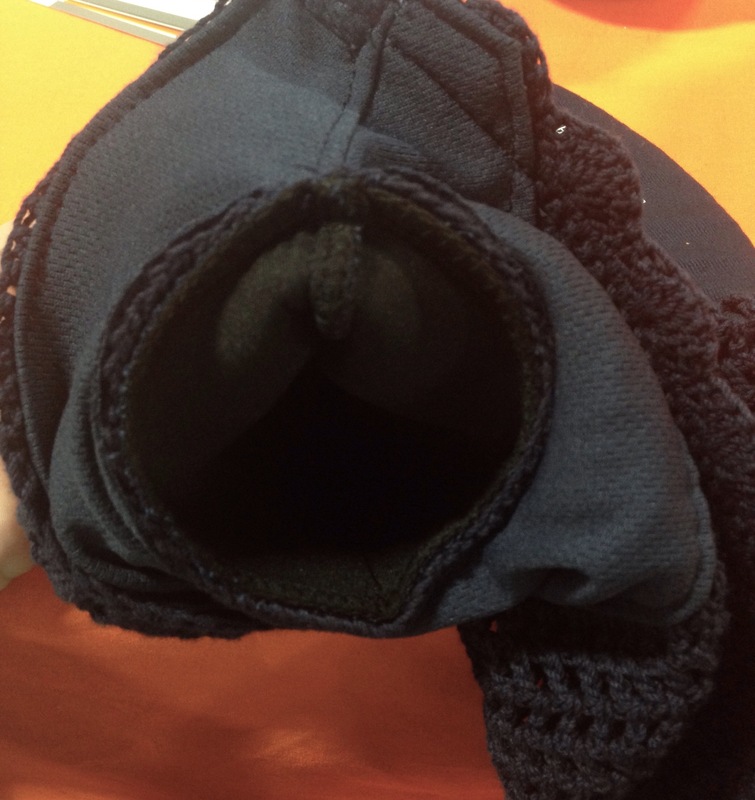 At Schockemohle we found those awesome neoprene lined ear bonnets for those who have horses sensitive to noise. Well… and those who do sports in which it’s actually legal to use them. 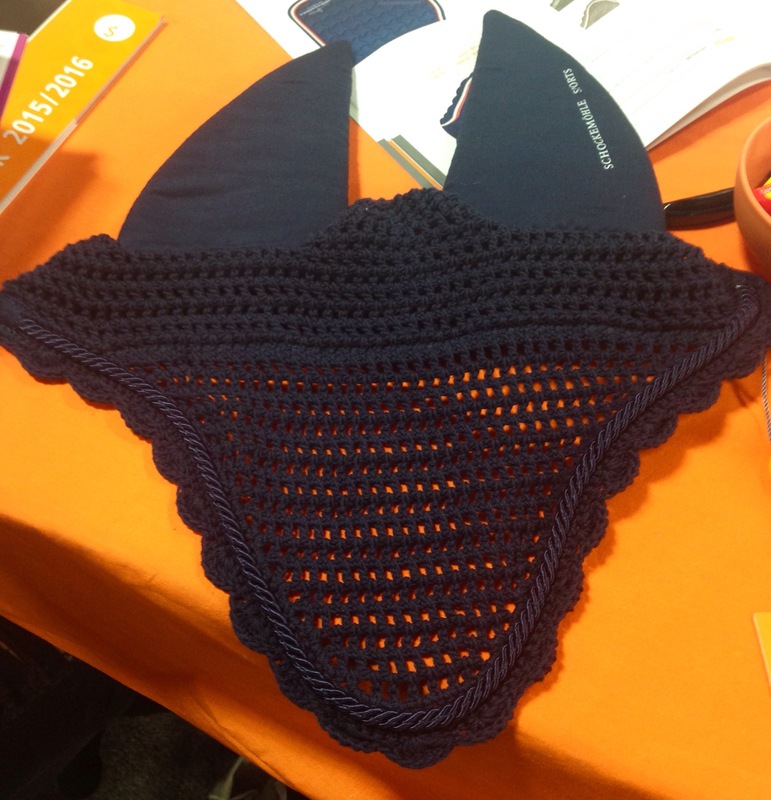 It’s called the Silent bonnet and comes in several colors. Schockemohle also had a very CROC bridle, if you’re really into that kind of thing. Nunn Finer is offering several bridles now with the slightly tapered noseband and browband design, including a hunter version. So for all the hunter riders out there that liked the general shape of the D’yon bridle but thought it was too jumpery, your bridle has arrived. 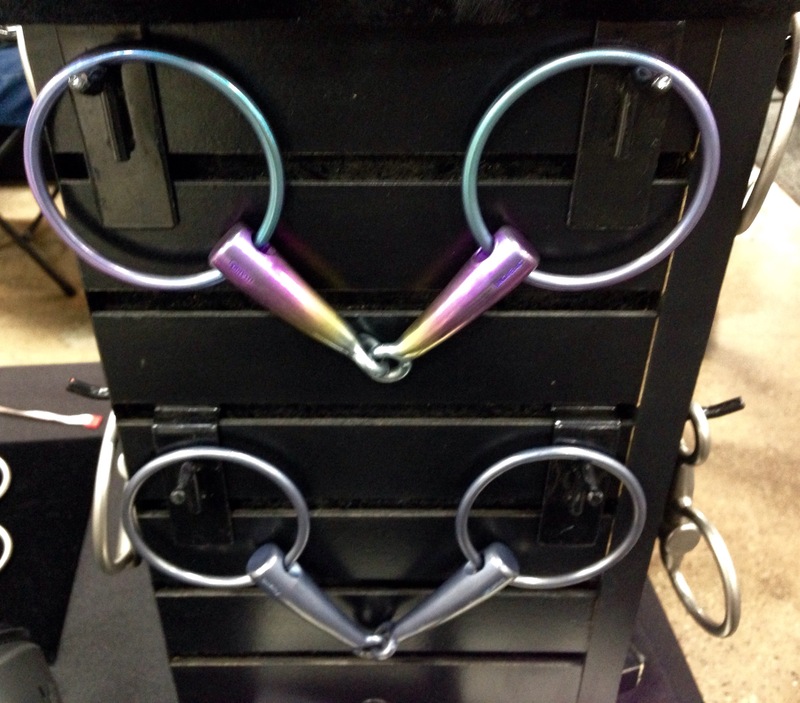 Or you can go completely the opposite direction and buy a pretty rainbow bit from Lorenzini, if you happen to ride a unicorn. The Majyk Equipe boots are exciting. I heard a rumor that sizes are supposed to come out later this year and I would love to try them if they do come out with a large enough option for the beasts legs. I got the D-teq open front boots from Equifit on black friday and while I like them I don’t love them like I wish I did. I had Equifit boots that I also tried really hard to love and just didn’t. The memory foam made the fit weird, and is super hot. Plus that’s a lot of $$$ for fake leather. The ME boots are very exciting to me! We will see how I feel about the boots after a bit more use. I do like that the d-teq material fixes the hard as a rock in winter issue as well as being a bit thinner so better fit. Since I have so few open front boot options in the large horse department and wanted removable washable liners that was really my only contender. Cross your fingers ME makes their boots large enough so I can enjoy them too! I’m pretty sure I’ll never be able to afford $180 boots unless they’re on super sale, but boy do those Majyk Equipe boots look amazing. I love the Equifit look too, but I’ve heard of the stud closures breaking/ tearing – I wonder if Majyk Equipe’s are a different material so maybe that won’t happen? Also, not sure if it’s just my eyes, but the fronts look like they have a really interesting taper to them? That’s really good to hear! I wasn’t really being fair before – I’ve know people also who’ve had them forever and are still going strong too! I just think it must be really disappointing to have the closures tear! I didn’t have my Equifits long enough to have any issues with them breaking. I just didn’t like that memory foam lining at all, I really don’t think it has any place on a horse’s leg. A lot of what I saw was just weird, and in a way that I didn’t like because it didn’t seem to be thought through very well. Like what happens when that blue gel leaks? Or when you lose the quick release pin thingy? Is a face full of croc too much? But what I liked about the ME line was that there was really a style for every preference and every price point. Three different closures (velcro, stud, buckle) and two different shells (plastic or leather) covers the whole market pretty well. I want to say it was around $300 but I don’t remember exactly. I’m pretending that if I get that cut in Nunn Finer it will somehow not look terrible on my horse the way the mark todd did. I know, I know. Pipe dream. Why must I love things that a tiny Courage head can’t handle? I’ve never been able to bring myself to pay for the Equifits, but if my Eskadrons ever die, or I need a prettier set of boots, the ME boots look awfully nice, for a not so crazy price point, especially if they’ll offer the full set of front and hind at a lower bundled price point. My local tack shop carries almost the entire full line of Schockemohle bridles, fly veils, and saddle pads, and I drool over all of their stuff when I go there. And yay for space age stirrups without the space age price. Their show coat is, IMO, the best one in that price range. Well, them or GP I suppose… it’s a toss up. I really like my Kerrits coat. There is so much drool right now. For one…omg Majyk. mah hart, may sewl. I NEED. Secondly, I also NEED those gel bit guards. Where can I hand over my money immediately?? And suddenly I need a rainbow bit. Is there a double jointed version? I have no idea, I only saw the one at the booth and didn’t see it on an admittedly very quick perusal of the website . Um hello, I ride a unicorn, he has a mustache and needs a rainbow bit! Those Magyck Equipe boots. That Nunn Finer bridle. I’m in love! I saw the gel bit guards at WEF last week and I thought they were pretty cool too! 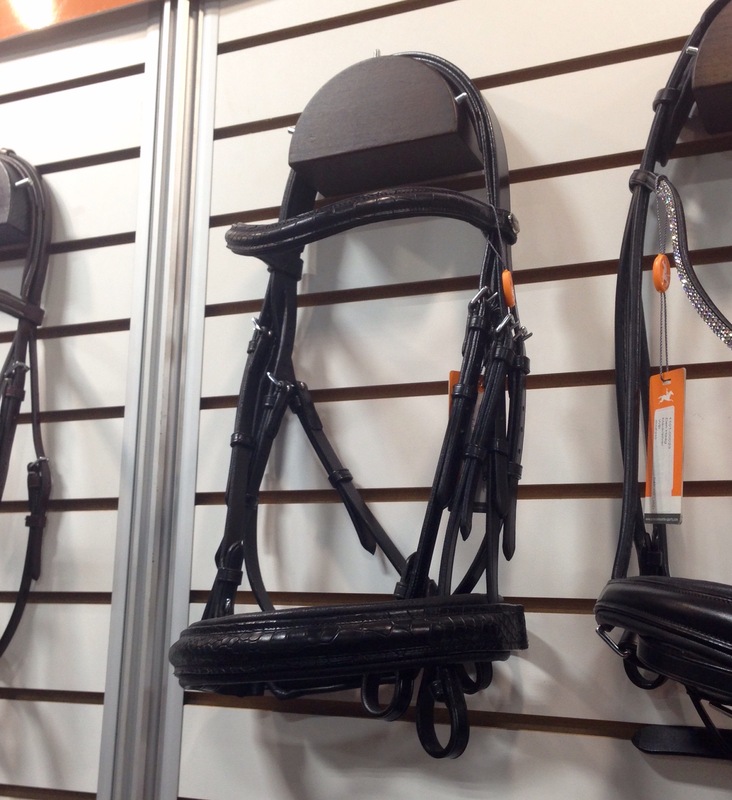 Aw I want that Nunn Finer bridle! Oh that bonnet looks crazy cool with the soft ears! I am not a fan of all the modern looking boots but some of the more classic styles look nice! !